Ava Gardner Museum background sheet. The star of such films as Ernest Hemingway’s The Sun Also Rises, and the MGM blockbuster musical Showboat, Ava Gardner was known as “the world’s most beautiful animal” at the peak of her career. With an Academy Award nomination for her portrayal of Honeybear Kelly in Mogambo, and a Golden Globe nomination for her role in Tennessee Williams’ The Night of the Iguana, she is probably best known for being the second Mrs. Frank Sinatra. The barefoot teenager, who took Tobacco Road to Hollywood via the Big Apple, put Johnston, NC on the map. It’s fitting that the place of her birth is home to the Ava Gardner Museum. It all started with a kiss. Little Tommy Banks was just 12 years old when he first met Ava Gardner in 1939. She was a promising secretarial student at Atlantic Christian College in Wilson. Everyday as Ava sat waiting for her ride home, Tommy and his pals would tease the young beauty and call her their “girlfriend.” One day she playfully responded by chasing Tommy down and giving him a big kiss on the cheek. That, in a sense, was the humble beginning of the Ava Gardner Museum. Two years later, Tom opened a newspaper and saw his “girlfriend” staring back at him. Ava had been “discovered” while visiting her sister in New York City. Her brother-in-law, a professional photographer, had displayed a photo of Ava in his storefront which caught the eye of a young man looking for a date. Ava soon got the call from Hollywood every young girl of the time dreamed about. MGM wanted to sign her to a seven-year contract. A few years later Ava was starring with Hollywood’s elite including Clark Gable, Humphrey Bogart, and Gregory Peck. Tom Banks saved every newspaper clipping and magazine cover he could find about the student-turned-starlet. Throughout his college days, a stint in the Navy, working as a publicist for Columbia Pictures, and during his career as a school psychologist in Florida, Ava made plenty of magazine covers for Tom to collect. And she made plenty of headlines when she married and divorced the likes of fellow MGM star Mickey Rooney, renowned bandleader Artie Shaw, and Frank Sinatra. Tom had an impressive collection, but nowhere to exhibit it. In 1978, Doris Cannon, a reporter for The Smithfield Herald, wrote a scathing editorial challenging local business leaders to honor Miss Gardner, which was the catalyst for the creation of the Ava Gardner Museum. Together, Ms. Cannon, Dr. Tom Banks, and his wife Lorraine organized a temporary exhibition of the collection in Smithfield, and it was such a success they began thinking about forming a permanent museum. Dr. Banks then purchased “The Teacherage,” a boarding house for teachers which Ava’s parents operated near Smithfield. 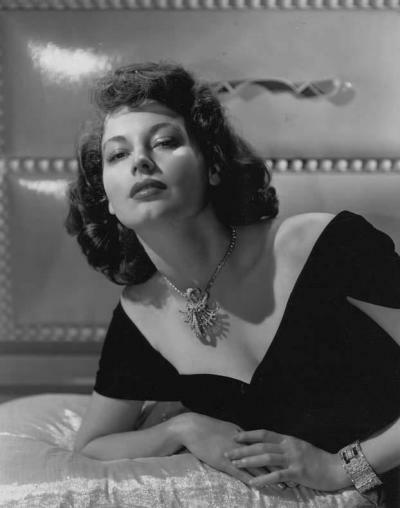 For nine years, the remote aging teacherage was home to the Ava Gardner Museum. After Miss Gardner’s death in January 1990, the Museum relocated to Downtown Smithfield, and ultimately in October 2000, a permanent home was secured to better accommodate the thousands of visitors from around the globe who travel to Smithfield each year to view her legacy. On display at the Museum are some of Miss Gardner’s personal items and clothing, in addition to authentic film costumes from Mogambo, The Sun Also Rises, The Great Sinner, East Side, West Side, She Went To The Races, Ride, Vaquero! and My Forbidden Past. Over the years, the collection has grown to include a number of large oil portraits, countless magazine covers, and literally thousands of photos of Ava, documenting her career spanning nearly five decades. Visitors begin their tour with a 15 minute video, and self-guide themselves through sixteen permanent themed exhibits that chronicle Ava’s humble beginnings, her loves, her movies and to her life in Europe. And to think it all started with a kiss.